When the snow began to fall, Saffron stopped running head on through the snow banks. She’d been plowing nose first into the freshly fallen little mounds, emerging on the other side almost triumphantly. But she’d never seen how these fluffy white hills were created. Now she peered skyward, blinking as a flake landed on her nose. And then another. I watched her face. She appeared to get it, figuring out that if enough of these little white things fell, she’d have another powdery burst through a pile of it. She resumed her foraging and spontaneous explosions through the snow mounds. She was part Stafford Terrier and part Dachshund. She’d been born two years ago in London and through the connection of a friend of a friend, I was able to get her shipped over here. She was the most affable dog I’d ever known and this was her first season of snow. At the end of the short narrow road we’d turned down, off the larger, plowed main road, was a small cabin I had not noticed before. Affixed to its side like a rock magnet was a large, wide red-brick chimney, starting at ground level and finishing four feet above the roof line. From it poured smoke so thick, it actually made me feel warmer just watching it. The cold air was so crisp that the smoke appeared as if it was a separate entity, a solid white object against the off-white, snow-cloud filled sky. 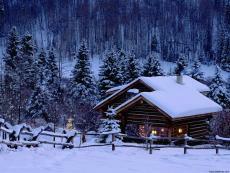 The cabin had a steeply sloped roof and thus far the snow had not stuck to it. Light glowed through the large window carved out of the face of the building. It began to snow more heavily, even though there was no wind. The flakes came in handfuls, as if tossed from above. Saffron looked quizzical, but blundered on, biting at the air when a large flake drifted by her nose. Suddenly the front door of the cabin opened and a tall, older, bearded man in his 70s stood there in jeans and a black and red plaid wool shirt, smoking a pipe. His slippers appeared to be suede and were trimmed in soft fur. “What can I do for you, young man?” he asked. I looked around. I’d not realized we may have been trespassing. Saffron was perched at my feet, eyeing him curiously. He nodded and blew a plume of pipe smoke upward. It smelled like cinnamon and dark rum. “Lived here about seven years now. Me and Julius,” and as if on cue, a large black Labrador stepped out of the cabin onto the small covered but unenclosed porch. He and Saffron stared at each other, tails wagging. Julius strolled over and the two dogs went through their sniff routine. Once the olfactory mysteries were solved, they went dashing off around the side of the cabin into the woods, Saffron in vain pursuit. I looked toward where the two dogs had disappeared. I could hear them thrashing about not far from the tree line. I nodded and walked up the two steps to his small porch, stomped the snow and mud off my Herman Survivor’s, and stepped into his toasty cabin. He closed the thick oak door behind me. He set his pipe down on a small plate next to a beautifully-carved wood lamp shaped like vase and sitting on an oak end table, and extended his hand. There was a sizeable cutout in the wall so one could see through to the kitchen, and from there out to the living room. Jessup looked enormous in the small alcove-like kitchen. He returned shortly with a steaming mug in each hand. I’d moved in front of the roaring fireplace; a medium-sized, half-moon shaped brick hearth. The heat was so strong I unbuttoned my coat and accepted the coffee. We both sat. Jessup was a large man who looked like he could easily still play Daniel Boone. A flat stomach, an athletic gait and huge, knobby hands that looked quite serviceable. He had a full beard and a full head of dark hair, and his eyes were also dark and very expressive. He looked to be about 75. There was a loud scratching at the door and Jessup got up and let the dogs in. They were both breathing heavily. Julius went to the front of the fireplace and immediately plopped his ponderous bulk down with a heavy sigh. Saffron hesitated, and then curled up next to him. They were asleep in about one minute. Both dogs had snow sprinkled on their coats. I did, choosing two thick pieces from the wood stacked neatly in a square copper pan next to the fireplace, and then stoked the bottom embers with the poker from the nearby wrought iron set. I returned to the sofa. Neither dog had stirred or even acknowledged my presence with a raised eyebrow. I sighed. What the hell. I grinned and nodded. He stood, took my mug and went to the kitchen. He returned with the refills. I noticed Julius watched him every step of the way. “Thanks,” I said, sipping the delicious strong brew. He leaned back and put his arm up along the back of the sofa cushions. He sipped his coffee and looked thoughtful. Saffron got up suddenly and came over to me and rested her chin on my thigh. I scratched her gently behind the ears. Saffron returned to the warmth of the fire and Julius’s bulk. Jessup sat quietly, watching me. There was a pop and then a hissing sound from the fire as sap dripped out of a log. All four dog ears went to point, and then curled back down. I got up and gave a low whistle, which brought Saffron on the run. I put my hand out and Jessup rose and took it. As Saffron resumed her cannonball blasts through the now freshened snow banks, I turned as I walked back up the road and could make out the silhouette of Jessup through his large front window. There was a muted yellow glow. He’d lit his pipe. He raised his right hand and waved. I did the same, turned and headed back on up to civilization. This page was created in 0.3600 seconds.